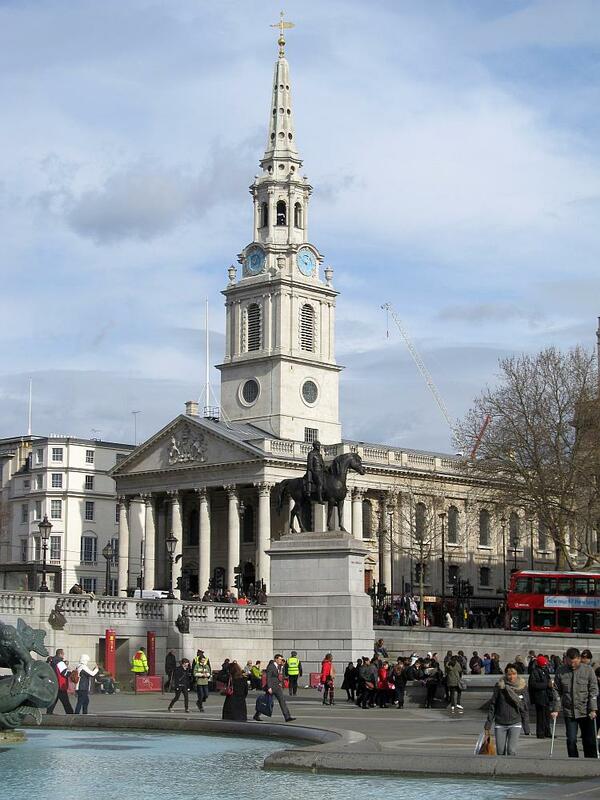 St Martin in the Fields, the iconic church on the corner of Trafalgar Square, is today famous for its music, but as well was influential in church architecture, and was the burial place of many artists. From the point of view of these pages, Nicholas Stone, the early British sculptor must be mentioned – more on him below. The sculptor Roubiliac also. And we should mention Nicholas Hilliard, the famous goldsmith and jeweller to Queen Elizabeth, Nicholas Lanier, and as an aside, the courtesan Nell Gwynn. 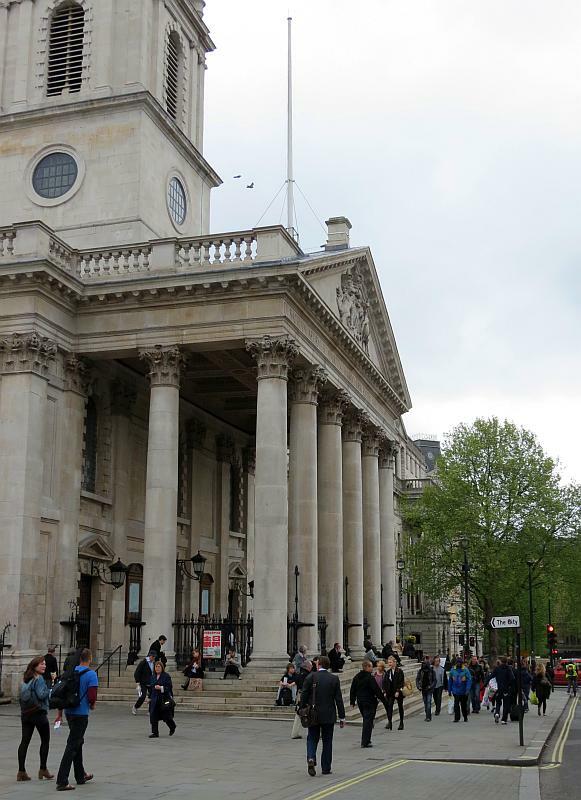 The architect was James Gibbs, who won this commission on the basis of his nearby church along the Strand, and the massive Corinthian portico is one of the most impressive of any London church. The controversial part of the church was the steeple, placed atop the Nave rather than visibly rooted to the ground to emphasise its weight and solidity, and many architects were inspired to follow this example, in Britain and apparently in America. The church dates from 1722-24, and replaced an older medieval structure from which a few monuments still remain, as we shall see. The 16th century structure was enlarged and repaired several times, survived the Fire of 1666, but was judged unsound and was demolished in about 1720. At that time relatives of those buried in the church were allowed to take away both remains and monuments, and apparently among those removed was the monument to Sir Amyas Paulet, in alabaster, which went to the church of Hinton St George. 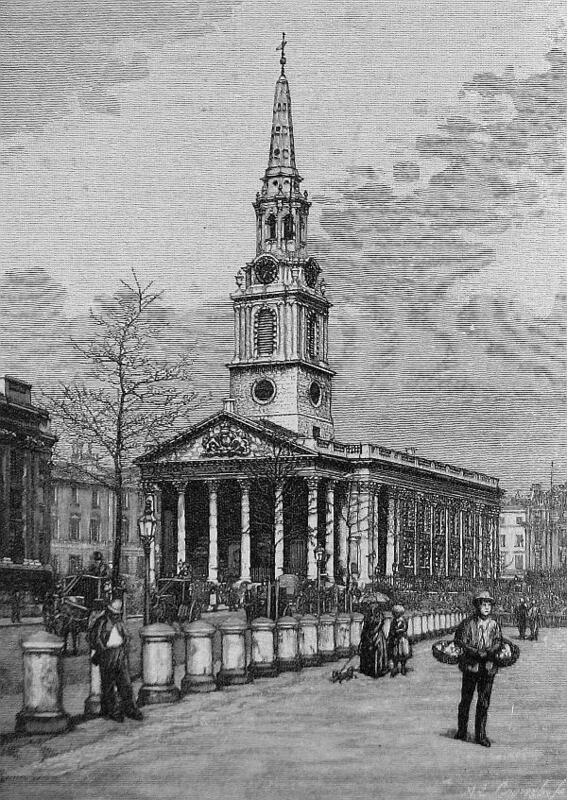 We should note that the splendid site of the new church only came about with the opening up of Trafalgar Square in the 19th Century, and at the time it was built, St Martins would have been quite hemmed in and not seen to such advantage. 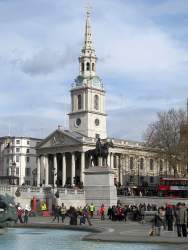 The exterior, in Portland stone, is notable for its Corinthian portico and its steeple (see the page on Gibbs). We may also note here the large carving of the Arms of George I, see bottom of this page. Inside, the nave is notable for its lightness and airiness, and delicate mouldings by Italian artists (Artari and Bagutti), as favoured by Gibbs. In the 19th Century, the church was presented with two busts by Rysbrack, one of which was of James Gibbs, but this has not been on display when I have visited, though I have seen photographs of it. There are two nice paintings at the East end, with mosaic background, from the end of the 19th Century. ‘To the Lasting Memory of Nicholas Stone Esqr. Master Mason to his Majestie. In his Time esteemd for his knowledge in Sculpture & Architecture wh[i]ch his works in Many parts do Testifie. And (though made for others), will prove Monuments of his Fame. He departed this life on ye 24. of August 1647. aged 61. And lyeth buried near the Pulpit in this church. Mary his wife & Nicholas his Sonne lye also buried in the same grave. She died Nov 19 & he on the 17 Sept. 1647. [N. Stones bas-reliefe his effigies also and round the effigies these words NICHOLAS STONE sculptor & architect &c.]. Vertue also notes that another son, Henry Stone of Long Acre, painter and Statuary, was also buried in the church and had a monument on the exterior of the church on the East wall near the Gate. 1900s view of St Martin in the Fields . The collection of monuments as it exists today extends to perhaps 50 or 60 pieces, though many are fragments, and others are simple plaques of interest for their inscriptions rather than any carved work. Until WW2 they hung on the walls and pillars of the nave, and in the choir and vestry, and by and large those on the pillars seem to have survived, and those on the walls mostly perished. What remains, together with some fragments from the old church which were already underground in pre-War times, are now all together in the crypt, bar a single plaque in the nave to Louisa Louis, d.1838, servant to Princess Charlotte of Wales, with a thick border carved with scrolls and a bit of foliage. Down underground, the monuments are nicely displayed and well lit, if losing something of their previous ambience by being placed in the new space beneath and now extending well beyond the old foundations of the church. Edith Bilson , d.1651, a pre-Fire monument to the ‘daughter and heire to Peter Bettesworth of Fining in ye county of Sussex. D. age 18’. An oval inscription with a curved panel below that the monument was erected by her husband T B. From what remains of the monument, we see a shield with lion to the left, and presumably once to the right, with carefully delineated hangings, very delicate, below, and above in the spandrel positions, small reclining cherubs, leaning on their elbows. Theodorus Mayernius , (Theodore Mayerne), d.1655, the most sculpturally significant monument in the church, a half-figure above a heavy base with a shelf, and a plaque bearing a long Latin inscription. 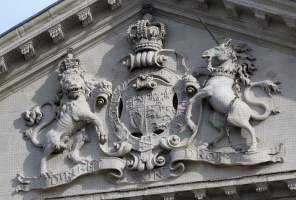 One side of the base is also preserved, a coat of arms with hanging drapes on either side, and a short festoon below, the whole nicely proportioned, and still bearing colour, black and brown and darkened white. The figure is mounted facing forwards. The Monument retains some paint, and shows the subject bearded, with high collar, perhaps a breastplate, and puffed up draper on his shoulders. All rather battered and the square base on which the half-figure stood is lost; yet nevertheless, a grim, proud, noble countenance survives. He was Physician to James I and Charles I, and had his residence in St Martin’s Lane. Mrs Jane Jackson , d.1670, ‘formerly servant to the Countes Dowager of the Rt Hon Robert Earle of Lindsey, Generall of his Majestie’s forces at Edge hill’. Discoloured marble panel with overall shield shape, with inscription flanked by knotted and falling drapes, a plump putti head above with broad wings to give a rounded top to the monument, and at the base, a malevolent skull. Note also above this piece, a dark little monument, or top thereof, showing just a shield and knight’s helm, with swirls around; the carving of boldness and vigour. Elizabeth Macdowall , d.1670, daughter of David Jolly, Gentleman, wife of Andrew Macdowall, with a rhyme. A slightly domed cartouche in pale marble, with a portrait head at the top, showing a youngish woman with a page-boy like hairstyle except for a pair of curls at the front and hanging down over her shoulders. She wears a necklace, and pearl-drop earrings. There is little effort to make her appear a classical beauty, and we see what may conceivably be a realistic portrait. Two cherubs act as pillars and rest their hands on her shoulders or ringlets, well sculpted but as ever, of considerable ugliness. At the base, among feathers and perhaps leaves, a little shield bearing a rampant lion and some small signs. Above it, and not connected with Mrs Macdowall, another fragment of shield and battered knight’s helm, and elegant flourishes, much broken. Johanna Miller , d.1673. Daughter of John Miller of Nether Wallop and of Esther, who afterwards remarried Rt Hon Lord Henry Powlet. White marble, inscript on rectangular panel with cherub head and broad wings below as brackets, swirls to sides and above, hanging fruits, and curly acanthus and a cartouche at the top. Very delicately carved and in good condition. Maria Augusta Murray , d.1840. Jumping ahead to the 19th Century and the new church, is this white marble panel with above, a portrait profile in high relief, surrounded by wide border and curved pillars and top, a bit baroque, a bit heavy. The portrait however is quite delicate, showing a refined young woman with large eye and nose above a smallish mouth, her ear too being small. Her hair tied in a bun. Henry Croft , d.1930, ‘the original pearly king’. We cannot ignore this. A stone statue of a man in suit and top hat, leaning on a short square column, larger at its upper end, the whole somewhat less than lifesize. A bit in the vein of seaside sculpture, but unusual to see something like this of such a late date. There are a variety of nicely carved fragments too. Oldest are probably the headless and handless kneeling female of Tudor date, and not associated with this, three small kneelers in high relief, much damaged, likely the female children on a larger monument from the old church. Next to the Bilson monument, and even older, are two fragments of dark stone, showing similar coats of arms. The first is a dark little shield, quartered, with a helm on top with a winged beast, originally a unicorn, but which has lost its front part to the jaws and nose, leaving a short snout, lots of swirls around, all in a perfect circle with a base and a projection on top, perhaps one of three such circles on top of a monument. The second fragment has more complex heraldic adornment, being in eight vertical divisions, divided horizontally to give 16 compartments, with various simple insignia, including a lion, perhaps a thistle, three flying birds, and nine standing birds among lesser designs. All surrounded by the remaining parts of an oval wreath of fruit and flowers, well carved and most three dimensional. These two are all that remain from the ‘spacious marble tomb and monument’ to William Cooke, son of Sir Anthony Cooke of Giddea Hall – the more complex crest is thought to be that of his second son, Sir Hercules Francis Cooke . Look out too for the complete top of a the white marble monument, being the shelf which would have been on top of the plaque, now missing, a coffin tomb with heavy drape lying over it, and the relief profile of a lady with a wreath of olive leaves around. The face is delicately modelled, and shows her as smooth skinned but perhaps past the first flush of youth, with a long neck, and with her longish hair pinned up and back close to the skull. No inscription remains, but we may guess at 1820-1840. Nathanael Hardy , d.1570, with Latin inscription, a plain pale plaque with a simple picture frame border, and cut out top corners. Of interest because of its very early date, for London, where most of the City Churches and their monuments to the east were lost in the Fire. Johannis Steward , d.1633 with a Latin inscription. The complete inscription from another pre-Fire panel which has lost its upper part, and any sculptural adornment this may have contained. Margaret Knight , d.1679, married twice, ‘a most exemplary Wife, Mother and Friend and so generally obliging as if born for any rather than Herself’. Nice script on a plain panel. Robert Clayton , alumnus of Trinity College Cambridge, with beautiful script on a plain panel, corner broken off so year cannot be read, but grouped with two plaques from the 1670s. Utrecia Tompson , Frances Utrecia Tompson , infants, d.1684 and 1686, daughters to John Tompson and Utrecia his wife. White stone plaque with heraldic arms above – a lion and a tortoise looking rather like a beaver - in a wreath. Benjamin Colinge , esq, from a Salop family, d1700, with an inscription noting he married Katherine, (spelt Cathrine later down the monument), descended of ‘ye Loyall Family of ye Ollivers of ye County of Darby, by whom he had Issue 11 Sons and 3 Daughters.’ A white marble plaque with scroll border to sides, base missing, shelf on top with shield above, damaged. It may once have borne more decoration above. Colonel Thomas Fraser , d.1756, Lieut Col of the Royal Remigment of Foot and Lieut Governor of Chester, served as Brigadier General in course of the late War in America. Date missing as base damaged. Rectangular panel with crossed arms etc behind a truncated diamond shield bearing a female face and a sunburst, all in an oval. Hon and [Revd] D Henry Moore , d.1770, and wife Lady Rooke d.1755. George Wilson , d.1788, and above it a fragment with curly script, dated 1770. John Lucie Blackman , d. 1797. Moses Hart , churchwarden, d. 1771. John Vilett , d.1779 [the only survivor, seemingly, from eight monuments on the north wall of the nave in pre-War times]. William Randall , d.1813, and son William Bright Randall, d.1840. Archibald Paxton , d.1817 and family up to 1845. Edmund Antrobus , d.1827, and wife Ann, d.1835. A panel with top shelf and sides as two scrolled brackets, with underneath a shield, damaged; the whole on a grey veined marble backing. Robert Finnie , d.1831, merchant of Rio de Janeiro. William Slaughter , d.1831, with a wide decorated pot with two little knotted drapes. Robert Stone of Panton Street, d.1832, and family through to 1840s; beneath, a panel to a survivor to 1852. No suggestion that these are descendants of Nicholas Stone, the sculptor noted above, though the thought is tempting. Alexander Copland , of Gunnersbury Park, d.1834 (or 1? ), a builder, who occupied a building off St Martin’s Lane, but as noted on the monument, died in Great George St. and with a note that his family erected a monument to his memory in Ealing Church (which I could not find on looking there). Also Lucy Copland, wife, d.1849, also commemorated in Ealing. Panel within heavy border of shelf, entablature, and two brackets acting as curved pillars. Andrew Hunter , d.1837, of the Haymarket. Ellen Prothero , d.1834, wife of David Prothero, Clerk of Llwynhelig in Carmarthen County (Wales). Richard Harris , d.1835 and wife Ann, d.1841, of Bedford Place Kensington and late of Stangate Street Lambeth. Sarah Ann Bell , d.1835, wife of Joseph Taylor. George Richards , vicar, d.1837 and Hannah Maria his wife, d.1844. Julia Watts , d.1837, and some of her family. Mary Clarke , d. 1837, and husband Robert George Clarke, d.1839, of Parliament. Charlotte Ann Broome , d. 1838, whose second husband was Ralph Broome of the Bengal Civil Service. William Key , d.1840. He was born in Dumfries, and died in James Street Haymarket. Hon Sir John Cross , d.1842, judge of the Court of Review. Elizabeth Leycester , d.1848, wife of Revd Oswald Leycester. The most recent monument, bar the Henry Croft statue noted above. And that is it. The lunchtime concerts are greatly recommended to the visitor to London, as is tea in the atmospheric crypt. 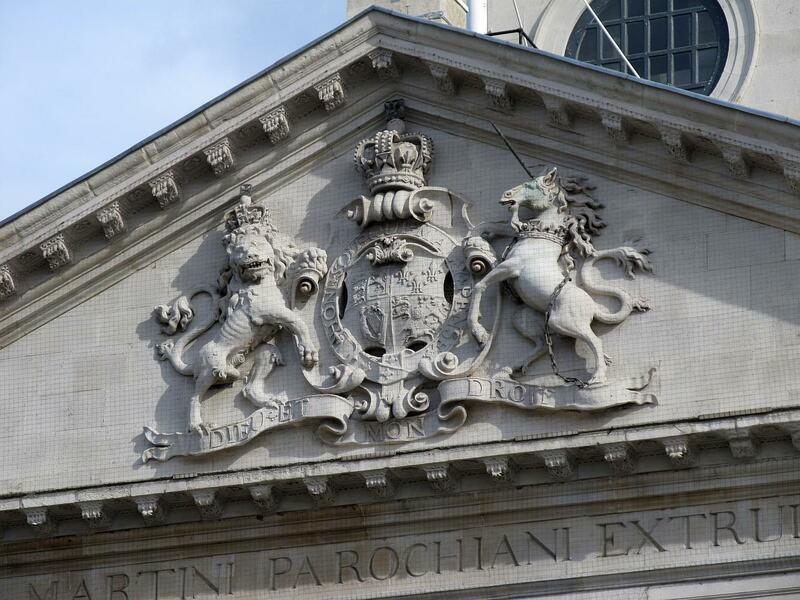 Royal Arms in the pediment .